EFLH2001 (encore plus récent) = 3 en 1 : mixeur, esc (contrôleur vitesse), HL rate gryo (= Heading Lock holding = gyro piezo à verrouillage de cap qui en cas de coup de vent ramène la queue à sa position d'origine; attention il ne fait pas l'unanimité) => il faut donc lui adjoindre un récepteur. Logique n'est ce pas ?? Mais attention !! Le EFLH2001 livré avec les CX3 a mauvaise réputation (soucis de réglage gyro + soucis de binds avec radios récentes 5 canaux et plus ... d'où entre autre le fait que le CX3 ne soit plus commercialisé (son canopy pénible à retirer et une mauvaise presse en sont les autres causes) alors que les CX2 le sont toujours ...). The 3-in-1 Control Unit installed on your model is a lightweight combination of main motor mixer, main motor electronic speed controls and a rate-mode piezo gyro. This 3-in-1 Control Unit functions just like the 4-in-1 Control Unit (EFLH1024) previously included with Blade CX2 models, but it does not include a receiver. After disconnecting both main motor plugs from the 3-in-1 Control Unit to perform the “Control Test” outlined on pages 16–19 in the instruction manual, it will be necessary to reconnect the plugs before continuing through the remaining steps outlined in the manual and before flight testing. The right-hand motor (when viewing the helicopter from behind) plug must be connected to the to the pins in the upper output slot on the 3-in-1, with the positive (red) wire lead oriented toward the top of the unit/helicopter. The left-hand motor plug must then be connected to the pins in the lower output slot, with the positive wire lead oriented toward the bottom of the 3-in-1 unit/helicopter. All other functions (including arming and adjustments) of the 3-in-1 unit will be the same as those outlined for the 4-in-1 unit throughout the manual. However, the 3-in-1 unit also features unique software that allows the main motor mixer and rate-mode piezo gyro to be disabled. 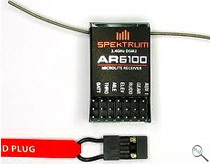 This, along with the separate Spektrum AR6100e receiver (SPMAR6100E), allows an optional heading lock-type gyro (sold separately) to be used for yaw control. 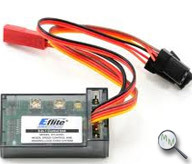 The Spektrum AR6100e receiver installed on your model weighs just 4.4-grams and is compatible with the included E-flite LP5DSM transmitter and other Spektrum DSM2 equipped transmitters and modules. 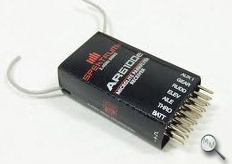 Please visit the AR6100e (SPMAR6100E) product page on www.SpektrumRC.com or www.HorizonHobby.com for more information regarding this receiver’s features and functions.